Every Friday night is pizza night for us. Last Friday night we set off for a new place, about a 25 minute walk from our apartment, only to arrive and find a sign Chiuso for ferie (Closed for the holidays) until late August! Yes folks, it is Ferragosto an ancient Roman tradition started by Emperor Augustus (it is his month after all), and co-opted by the Catholic Church as the “Feast of the Assumption.” Ferragosto is a one-day holiday on August 15 that can be expanded up to a full month for small businesses that choose to shut down. What makes our experience worse, Ric had walked by on Thursday to make sure they were open: they were and no sign about ferie. I had called for reservations and was successful. But there are two restaurants with the same name and I had called the one across town. Upon arrival, we found the sign, hastily posted that very day. Chiuso. We salvaged Friday night with a nice little dinner in a cafe across from our targeted establishment and had a fine experience. But we hadn’t had our weekly pizza! So Saturday we ventured far across Rome to Trastevere (literally “across the Tiber”) and wound our way through alleys to find once again Dar Poeta. Dar Poeta – Absolutely worth the wait! The expediter did a great job. Tables cleared quickly and we were seated in about 20 minutes. We had eaten lunch here in October 2010. No crowds at lunch as Romans don’t eat pizza for lunch. Despite the crowd last night, we waited only about 20 minutes. From their English language webpage: Our pizza isn’t neither roman pizza (low and thin), nor neopolitan pizza (thick on the edge and spongy), our pizza is . . . DAR POETA. We remembered it being good from our 2010 visit, but it really is the best we’ve had in Rome so far. Ric had a zippy lingua di fuoco (tongue of fire: hot salami and peppers), while I sought out the non-traditional salmone e fiori di zucca (salmon and zucchini flowers). So happy! Sorry, but I ate about a third of it before thinking of all of you in the Pacific NW who would love to see salmon on a pizza. Starring lox and zucchini flowers, by American standards, not a “normal” pizza, but my was it delicious! We will continue our search for the best pizza so when you come to Rome to visit, the work will be done for you. We don’t mind helping out. You can thank us later. BTW, we get Wednesday off as a paid holiday. Rome is already a ghost town as so many people are on vacation, so we’ll see what it’s like on the actual holiday. Buon Ferragosto! Laurel, You are killing me with all those awesome posts. Especially the food. Keep it up because I feel like I am right there with you. Hugs to Ric. Love and miss you both. Hi Kym! This post worked on Rick Horton too. He and his family met up with us for dinner Wednesday night and we went back to Dar Poeta with them! They are on their way back to Oregon today. Hear you have Roman-type heat right now. Hope you cool off soon! Hugs! Say hi to the crew at the Zoo! Thanks Grier! We have friends traveling in today and they are insisting on Dar Poeta because of my blog, so back we go! Perhaps I’ll try a different variety…. You and my husband have been trading emails about our upcoming week in Rome. Now I really can hardly wait to get there! 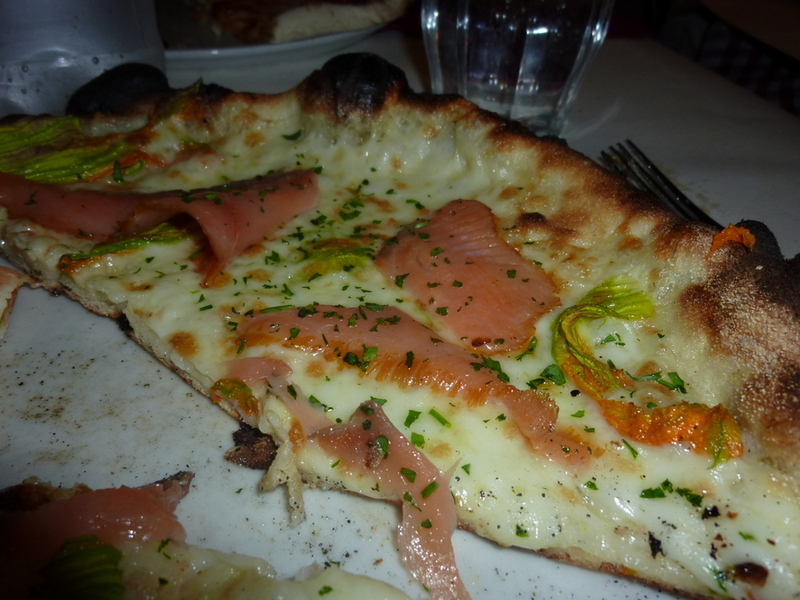 Even tho we’re from Seattle I don’t think I’ll go for salmon on my pizza. Looking forward to meeting you and Will if time permits in your schedule. I know you will have a wonderful trip! Dar Poeta sounds great but could you manage it twice in the same week?!? Looking forward to seeing you soon. Ciao Laurel and Ric — your write-up has me forlorn for Roma, and Trastevere in particular. I love that area! I haven’t tried Dar Poeta, but I’ll give it a try when I’m next back over there (probably in October). Have you checked out “Bir e Fud” in Trastevere? Nice pizza, great Italian craft beers to go with them. 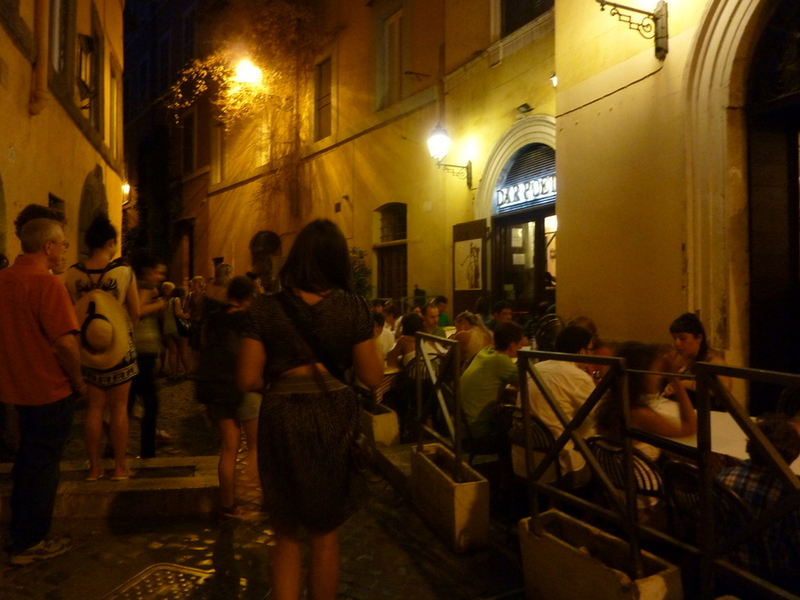 It’s a bustling, 30-something Trastevere crowd there, and you’ll probably need a reservation. You might want to check it out, they’re at Via Benedetta 23. Hope to see you two this fall. ciao Michael! Bir e Fud is on our list! Do hope to see you this fall. We are headed to the Cinque Terre week of October 8.